Mt.Morris Historical Museum – NEWS FLASH! Beginning on Saturday January 13, 2018 the Mt. Morris Historical Museum will be open to visitors from 11a.m. to 1p.m thanks to volunteers from the local chapter of the PEO who have very graciously offered to staff the museum for more expanded visiting hours. P.E.O. is an international organization which formed in 1869; the Mt. Morris chapter organized in 1929. P.E.O. is a philanthropic organization where women celebrate the advancement of women; educate women through scholarships, grants, awards, loans and stewardship of Cottey College; and motivate women to achieve their highest aspirations. Locally, Chapter CU has implemented the Margaret Mitchell scholarship as well as sponsoring yearly scholarship monies through OHS and supporting international projects. Beginning this year, Chapter CU will be working with the Mt. Morris Museum in having open hours the 2nd Saturday of every month from 11a.m. to 1 p.m. for visitors. 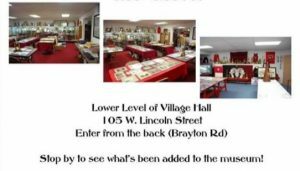 Access to the museum will be from the south entrance of the Village Hall on Brayton Rd. using the entrance that is used for voting in elections. New pieces of local history are added as donations from local residents come to us and the displays change in small ways between each open house. Donations of local history are always welcome as well as monetary donations to support the missions of the museum.